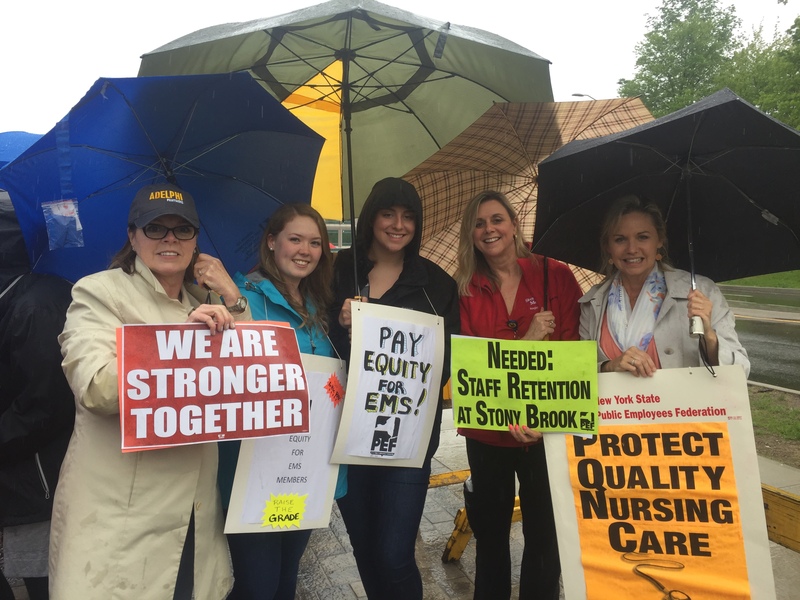 Several dozen nurses, emergency medical service workers, and union leaders stood in the rain at Stony Brook University Hospital on Wednesday protesting what they said are wages that are far below those at neighboring hospitals. 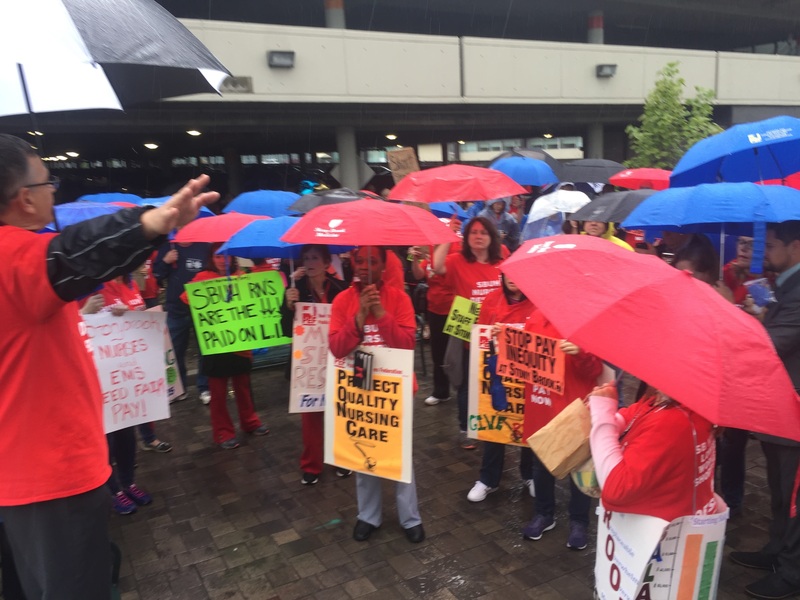 The group — made up of employees of the state-funded hospital and supporters — wore red T-shirts with the words "We Deserve Better" printed on the back and spoke about how the hospital’s lower wages have led to low retention rates of new registered nurses, and increased workload and hours for those remaining. The Stony Brook hospital is part of Stony Brook Medicine, which includes the university, two other hospitals and scores of community care facilities. "Stony Brook University Hospital is supportive of our nurses, EMTs and paramedics. We work every day to foster a positive work environment where all employees are valued and respected,” a hospital spokeswoman said in a statement Wednesday. Catholic Health Services of Long Island, which runs St. Charles Hospital, declined to discuss salary information for nurses. Northwell Health System, which operates John T. Mather Memorial Hospital, Southside Hospital and Huntington Hospital, declined to provide details about compensation. 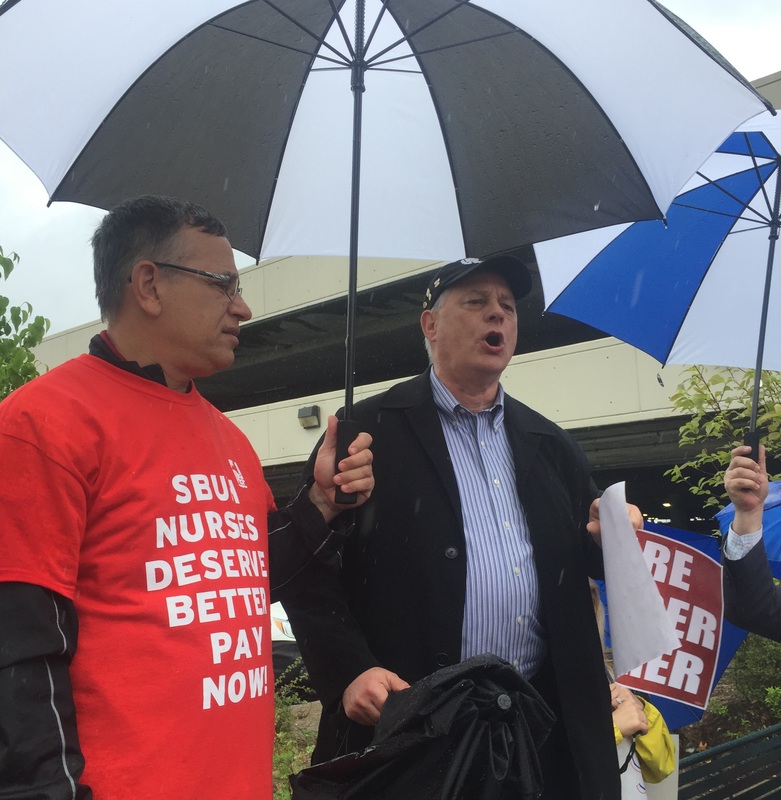 Stony Brook Medicine has nearly 2,000 nurses and EMS workers, Spence said. 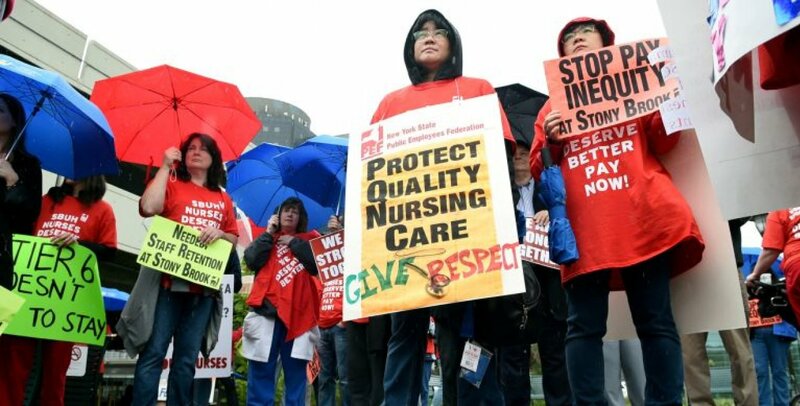 Nurses and paramedics at the protest said lower wages have led to a cycle of training new staff members only to have them leave for neighboring, privately funded institutions one or two years later. Registered nursing is one of the Island’s fastest-growing occupations. The number of RNs here jumped 20 percent between 2013 and 2017, to 28,600, U.S. Bureau of Labor Statistics data show. In 2017 the annual median pay for registered nurses on Long Island was $90,060, up 9.5 percent from 2013, according to data from the BLS.